The AMD CES 2019 event for AMD was full of reveals of the upcoming Matisse (Ryzen 3000) series of processors. Lisa Su, the companies CEO in follow up interviews also confirmed leaks that AMD would continue its relentless pressure on Intel by upping the core count of its CPUs further with the next generation processors, but stopped short of giving the number of Zen 2 processors that’d be packed into the Ryzen 3000 package. An Engineering Sample processor has been spotted on the UserBenchmark database, and reveals a few key details concerning the next generation Ryzen parts. The Ryzen 3000 sample is known as ‘2D3212BGMCWH2_37/34_N’ and as we can see on the string, there’s the number 37 and 34. These represent the turbo and base clocks, respectively. The page also identifies the TDP rating of these processors as 105W. 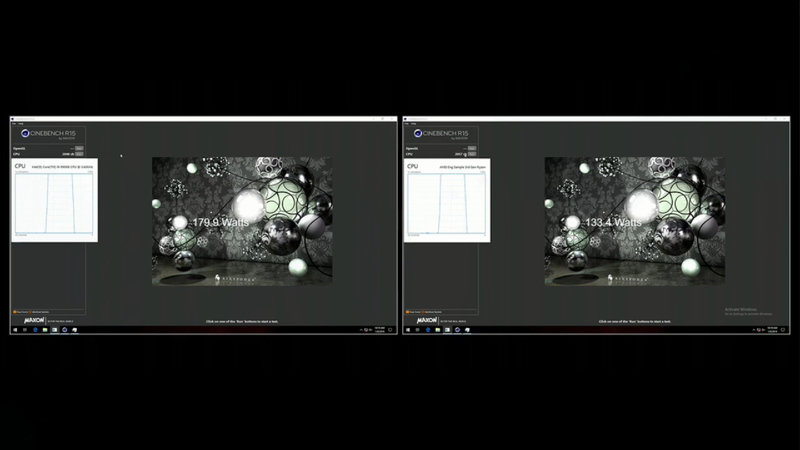 The Zen 2 processor apparently ‘averaged’ a clock frequency of 3600MHZ. There’s also a 32MB of level 3 cache, which backs up what we’ve reported from our own sources, and also makes sense with the Zen architecture. Essentially, each of the CPU dies (which is comprised of 8 individual X86 cores) are connected to their own 16MB level 3 cache. Other takeaways include memory speeds – there’s a single 4GB DIMM present, running at 2,666MHZ – the same clock frequency we saw at AMD’s CES 2019 event. I’ve heard from sources AMD is targeting 3200MHZ. It’s likely that because the Zen 2 chip seen here is just an Engineering Sample, AMD are focused on chip stability and debugging. Doing this with a single memory module at lower clock speeds helps eliminate the IO controller (the 14-nanometer larger die we see on the Matisse chips) out of the equation, and instead just focuses on the CPU and “is this stable?”. There are also several very important things concerning the benchmark score. Firstly, the single core score is running at roughly on par of the Ryzen 7 2700X – despite the 2700X having a rather large clock speed advantage (at up to 4.3GHZ…). Remember – this is with a very poor memory configuration – we’re essentially seeing the processor not just run lower memory, but on a single channel RAM and with a far lower clock frequency on the processor compared to the Ryzen 2000 series. Yet its still at least as fast as the Ryzen 7 2700X. This also brings some interesting questions up regarding AMD’s CES 2019 event. 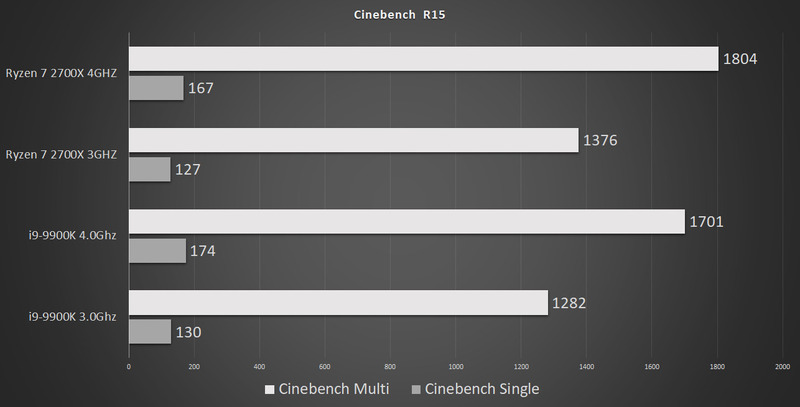 We saw AMD slightly pip the ‘Stock Speed’ Intel I9-9900K to the post in cinebench R15. In our Ryzen 7 2700X vs Intel I9-9900K IPC testing article, we pitted the two CPUs against one another at the same 3GHZ and 4GHZ clocks. Interestingly, the two CPUs are very similar in CBR15. This means that we can logically say that the 8 core sample Ryzen 3000 sample we saw on stage was likely running at 4GHZ or so, with most of the performance gains coming purely from IPC to hold up against the Intel part. With a lot of changes to the processors front end (caches, branch prediction and so on) it’s probable that SMT is more efficient too, likely nudging the multi-threaded performance up a bit. Personally, I am pretty confident there’s a lot of room left in the clock speed tank for AMD. Indeed, I suspect we’ll see the CPUs breaking the mid to high 4GHZ barrier with all core turbo. It’s less clear what we’ll see for the single core speeds though. In the above demo, we saw the AMD 8 core Zen 2 engineering sample CPU, featuring an 8-core Ryzen 3000 processor up against a stock I9-9900K. 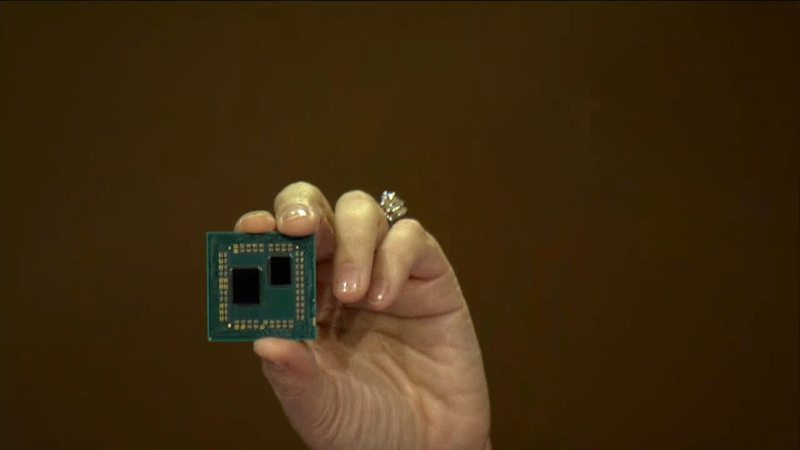 The power draw between the two processors is tangible, and here AMD’s processor is only pulling around 70 – 80W of power (meaning lots of room left to raise clock frequencies). At the risk of repeating ourselves, Intel is likely going to be largely unable to respond for about half of a year (assuming they hit the target release date of Ice Lake, which is the end of 2019) against anything over AMD’s mid-tier SKUs. Furthermore, AMD has a chance to literally decimate Intel in the price versus performance war. Assuming AMD release a four or 6 core processor that hits even the mid 4GHZ range for around the 100 USD dollar mark (and I don’t think this is even slightly optimistic, instead I feel this is the minimum we can expect) the company will essentially decimate anything Intel has to offer aside from the Intel I7-9700K with what we can presume would be one of AMD’s lowest-end SKUs. The launch date of Ryzen 3000 will be Q2 2019, and according to our sources, we will see a June 2019 announcement date for AMD’s NAVI series of graphics cards, with the company having the cards on shelves by July of this year. These graphics cards will be critical for the company to hold off Nvidia’s recent Turing onslaught. This article was filed under Features, Gaming News, Hardware. Tagged with 12 core, amd 7nm, matisse, ryzen 3000, zen 2, zen 2 processor.